The busy part of summer ended Wednesday afternoon when the train pulled out of the station; actually it ended when I finished loading the cars and pointed the car east, then north early Thursday afternoon. I could feel the muscles in my neck loosen and relax with each mile away from home. Sure, we have work to do, there is always something to keep us busy, to keep us on our toes – we have two kids, a house, and a dog and that’s more than plenty. B has plenty of gardening work and I have to begin thinking of the coming school year. Up close, the work is easy, it’s when I look at what I have to do from afar that it seems monumental and overwhelming. One step at a time. W’s last football practice and summer game was last Saturday (7/17) and then it was time to finishing packing and preparing him for Philmont. Because W is gluten sensitive, we needed to provide alternate meals to make sure he didn’t get sick on the trail. The entire process stressed B out, and me by association – she was toast and needed a diversion. We worked in the garden Monday afternoon. She weeded and I got mulch for the front beds and we both spread it. 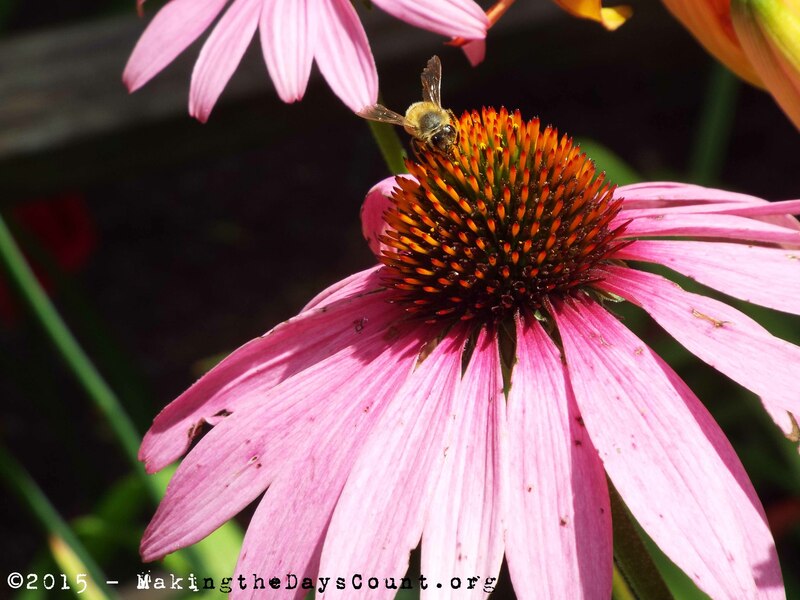 When it was time to move to the back beds, I gave O the camera – she wasn’t helping so I figured she and her friend, J, could have fun with the camera capturing the beauty of the mid-July flowers: lilies, coneflowers, and emerging black-eyed Susans. O and J had a ball and captured the beauty of B’s garden up close. O discovered we have a hive of bees living in the hollow of one of the split-rails fence posts and the bees especially loved the coneflowers, as you can see in O’s photos. All of the photos in this post are hers. I spent Friday unpacking and organizing our stuff at the cottage. We had friends over for dinner Friday night – burgers and dogs – and our first campfire of the season. Sitting beside the campfire, I watched the night sky come to life as the sun’s rays slid beyond the horizon. What was above was far from up close. The stars and planets above are as far away as the blooms were up close. The light from the stars was older than me, and that is a hard concept to wrap your brain around, so I’ll save my star post for another time. Saturday morning, it’s time to look at my world again, up close. Today is gonna be a great day. The boat goes in the water, the kids go on the tube, and we give them a ride and maybe I’ll catch one, too. AND, it’s race day, too. Even at the cottage, we’ll be busy, but that’s a good thing. Making the Days Count, one day at a time, looking closely, looking deeply, watching for the unexpected. What did you see the last time you looked closely, up close? This post is in response the WordPress Weekly Photo Challenge: Close Up. So this week, get up close and personal with your subject — whether it’s the pollen on a newly bloomed flower, rust on an old fence, or water droplets left by a storm — and capture those tiny, fascinating details that might go unnoticed. If you look closely, you might see B and O, W’s long gone and out of the frame though some his scout buddies make an appearance. Thank you – the days move quickly, sometimes too quickly with two active children growing and learning. I savor the morning time before they wake on a calm Monday morning in July. O loved shooting the flowers and was very proud of her bees, I showed her the post and she smiled. Perhaps I can coax her into more photos and a guest post… you never know. Thanks for stopping in – have a wonderful week. Should I stay or should I go. I would just to be up close with your counting the Days. Awesome closeness. Well Done! Blessings. Thank you. I love that song and couldn’t resist. The scouts are on their hike by now. i can’t wait to hear all about it. For now, I’ve got to get moving or the day will pass me by! Have a great day. Great photos, O! Clay couldn’t have done this post without you. I showed the post to when it was done and she said, ‘thanks, dad – nice post. Aren’t you glad I took those photos?’ I replied. ‘I sure am O, I sure am. Love ya” I am going to set her loose with the camera this evening when the lighting is better.Maybe I can get her to write a guest post. Thank you. My husband and oldest son did Philmont a few years back. Talk about a grueling 12-day hike! They said they got to shower twice. Needless to say neither them nor their clothes smelled too good when they got back. 😉 Best of luck to your son! Thanks Carrie. He was excited and all business at the train station. He’s the crew leader for the trek and we are very proud of him. I pick him up at the airport – they fly home – Wednesday 8/5 and have him int he car for 6 plus hours Thursday morning. I’ll be lucky to get more then 6 words before he falls asleep. I can’t wait to her all about it!